The San Diego Padres visit Citizens Bank Park on Sunday, July 9, 2017 to play the Philadelphia Phillies. The probable starters are Trevor Cahill for the Padres and Jerad Eickhoff for the Phillies. The opening line for this matchup has San Diego at +106 and Philadelphia at -116. The Padres have a 42-39-5 over/under record and a 44-42-0 run line mark. The Phillies are 42-43-0 against the run line and have a 39-39-7 over/under record. The Padres have a 37-49 overall record this season. Starting pitcher Trevor Cahill has a 3-2 record with an earned run average of 2.96 and a WHIP of 1.23. He has 55 strikeouts over his 45.2 innings pitched and he's given up 37 hits. He allows 7.3 hits per 9 innings and he has a FIP of 2.98. The bullpen has an earned run average of 4.58 and they have given up 271 base hits on the year. Teams are hitting .235 against the bullpen and they've struck out 333 hitters and walked 117 batters. As a team, San Diego allows 8.9 hits per nine innings while striking out 8.5 batters per nine innings. They are 23rd in the league in team earned run average at 4.67. The Padres pitchers collectively have given up 746 base hits and 389 earned runs. They have allowed 112 home runs this season, ranking them 10th in the league. San Diego as a pitching staff has walked 283 batters and struck out 712. They have walked 3.4 men per 9 innings while striking out 8.5 per 9. They have a team WHIP of 1.37 and their FIP as a unit is 4.50. As a team San Diego is hitting .228, good for 30th in the league. The Padres hold a .384 team slugging percentage and an on-base percentage of .295, which is good for 30th in baseball. They rank 30th in MLB with 7.5 hits per game. Hunter Renfroe is hitting .232 with an on-base percentage of .287. He has 72 hits this season in 310 at bats with 39 runs batted in. He has a slugging percentage of .452 and an OPS+ of 92. Wil Myers is hitting .251 this year and he has an on-base percentage of .326. He has totaled 78 hits and he has driven in 42 men in 311 at bats. His OPS+ is 107 while his slugging percentage is at .466. The Padres have 636 hits, including 110 doubles and 99 home runs. San Diego has walked 248 times so far this season and they have struck out 805 times as a unit. They have left 543 men on base and have a team OPS of .678. They score 3.59 runs per contest and have scored a total of 305 runs this year. Philadelphia has a 28-57 overall mark this year. With an earned run average of 4.93, Jerad Eickhoff has a 0-7 record and a 1.53 WHIP. He has 65 strikeouts over the 76.2 innings he's pitched. He's also given up 87 hits. He allows 10.2 hits per nine innings and his FIP stands at 4.2. The bullpen has an earned run average of 4.64 and they have given up 285 base hits on the year. Teams are hitting .258 against the Phillies bullpen. Their relievers have struck out 265 batters and walked 120 opposing hitters. As a team, Philadelphia allows 9.3 hits per nine innings while striking out 7.5 batters per nine innings. They are 24th in the league in team earned run average at 4.72. The Phillies pitchers as a team have surrendered 775 base knocks and 392 earned runs this season. They have given up 119 home runs this year, which ranks 6th in Major League Baseball. Philadelphia as a staff has walked 277 hitters and struck out 621 batters. They give up a walk 3.3 times per 9 innings while they strike out 7.5 per 9. Their team WHIP is 1.41 while their FIP as a staff is 4.79. As a team, they are batting .242, good for 25th in the league. The Phillies hold a .390 team slugging percentage and an on-base percentage of .304, which is good for 27th in baseball. They rank 24th in MLB with 8.3 hits per contest. Odubel Herrera comes into this matchup batting .258 with an OBP of .295. He has 82 hits this year along with 28 RBI in 318 AB's. He maintains a slugging percentage of .393 with an OPS+ of 81. 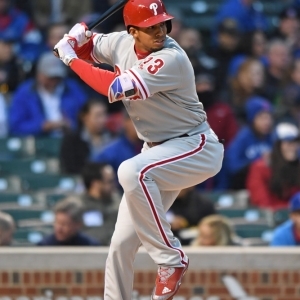 Aaron Altherr is hitting .280 this season and he has an OBP of .349. He has collected 73 hits in 261 at bats while driving in 43 runs. He has an OPS+ of 126 and a slugging percentage of .517. The Phillies as a unit have 693 base hits, including 147 doubles and 81 homers. Philadelphia has walked 245 times this year and they have struck out on 726 occasions. They have had 542 men left on base and have an OPS of .695. They have scored 3.82 runs per game and totaled 321 runs this season. Who will win tonight's Padres/Phillies MLB game against the spread?